This woman has beauty. This woman has glamour. This is the same woman, a halat virgin. When she was girl child and adolescent this woman was patient enough to know how to work on her moral, psychological and physical beauty to become top apple (Reason # 8: Be patient, know how to become top apple) Therefore she is out of reach for those men who get the rotten apples from the ground that aren't so good but easy. She knows that men are like apples on trees too, the best ones who wait for the right woman are on the top of the tree. She is brave enough to climb all the way to the top of the tree because she values quality. 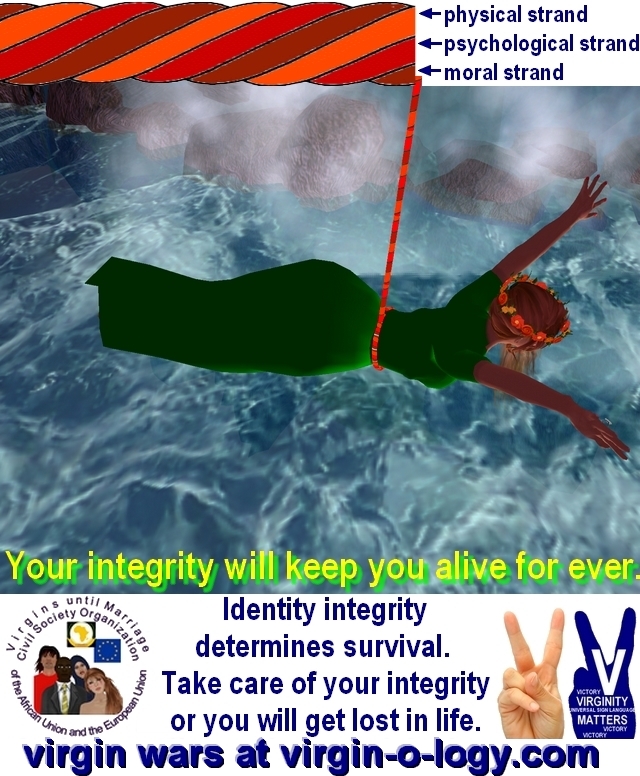 She is not afraid of falling down because she is secured with a three strand laid rope depicting moral, psychological, and physical integrity of each human person. She cannot compete with someone else's more evident beauty though. But she could beat all competitors beauty if she had glamour. She wants to offer her virginity to her future husband and establish a happy family. But what if her physical beauty vanishes, trace by trace, in the course of passing years, consecutive pregnancies, the baby weaning and all those regular and sometimes exorbitant problems with health, money, accidents etc. of everyday life in the family. What if the beloved man, her husband, the one to whom she offered her virginity, and who is the father of her children, suddenly gives up his high moral standards and decides to abandon her and his children because of falling in love with someone else. With someone resembling her when she was young. She cannot compete with someone else's beauty anymore. Work on your personal growth to have glamour. Scheherazade had glamour. Now is your turn. for moral, psychological, and physical integrity of each human person? all of them recommending your immortal soul to merciful God's judgement. by various authors, translators and scholars in various countries. 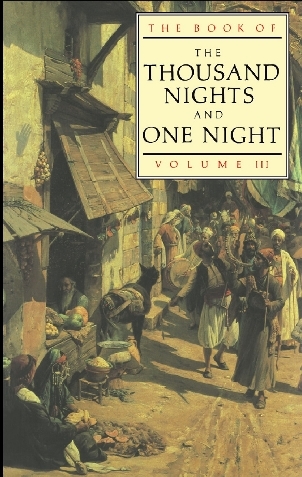 Thousand Nights and a Night. 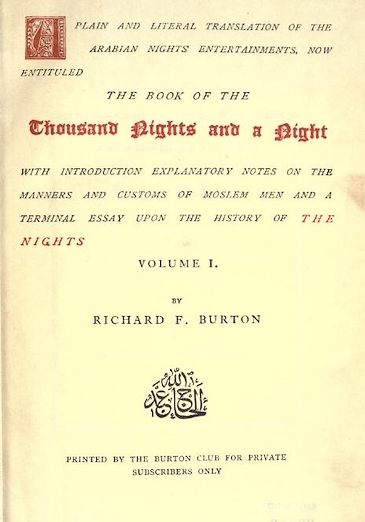 With Introduction Explanatory Notes on the Manners and Customs of Moslem Men and a Terminal Essay upon the History of the Nights. First edition of 1885 - 8 in ten volumes. Printed by the Burton Club For Private Subscribers Only. فلما سمعت ابنة الوزير مقالة أبيها قالت له: لا بد من ذلك فجهزها وطلع إلى الملك شهريار وكانت قد أوصت أختها الصغيرة وقالت لها: إذا توجهت إلى الملك أرسلت أطلبك فإذا جئت عندي ورأيت الملك قضى حاجته مني قولي يا أختي حدثينا حديثًا غريبًا نقطع به السهر وأنا أحدثك حديثًا يكون فيه الخلاص إن شاء الله. ثم أن أباها الوزير طلع بها إلى الملك فلما رآه فرح وقال: أتيت بحاجتي فقال: نعم فلما أراد أن يدخل عليها بكت فقال لها: ما بك فقالت: أيها الملك إن لي أختًا صغيرة أريد أن أودعها فأرسلها الملك إليها فجاءت إلى أختها وعانقتها وجلست تحت السرير فقام الملك وأخذ بكارتها ثم جلسوا يتحدثون فقالت لها أختها الصغيرة: بالله عليك يا أختي حدثينا حديثًا نقطع به سهر ليلتنا فقالت: حبًا وكرامة إن أذن الملك المهذب فلما سمع ذلك الكلام وكان به قلق ففرح بسماع الحديث. 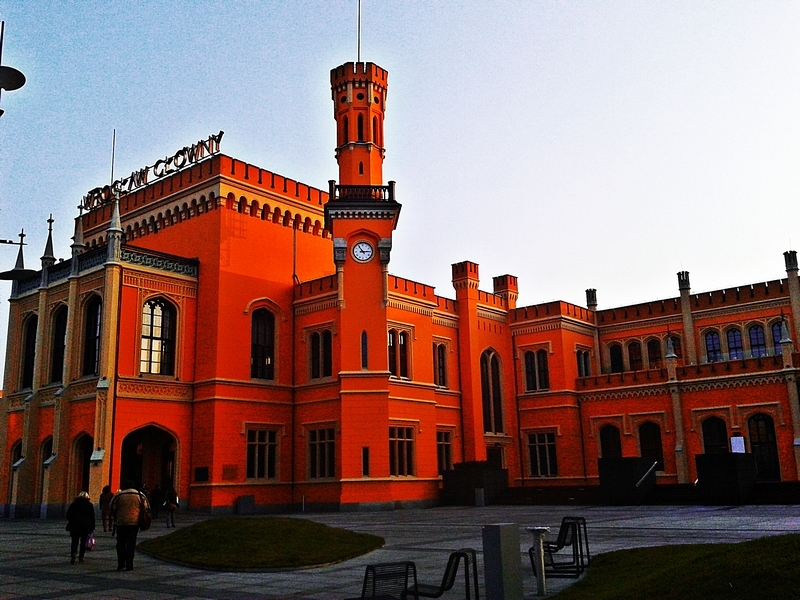 the better to speed our waking hours.' And I will tell thee a tale which shall be our deliverance, if so Allah please, and which shall turn the King from his bloodthirsty custom." Dunyazade answered "With love and gladness." So when it was night, their father the Wazir carried Scheherazade to the King, who was gladdened at the sight and asked, "Hast thou brought me my need?" And he answered, "I have." But when the King took her to his bed and fell to toying with her and wished to go in to her, she wept, which made him ask, "What aileth thee?" She replied, "O King of the Age, I have a younger sister, and lief would I take leave of her this night before I see the dawn." So he sent at once for Dunyazade and she came and kissed the ground between his hands, when he permitted her to take her seat near the foot of the couch. Then the King arose and did away with his bride's maidenhead and the three fell asleep. The Wroclaw/Habicht edition of The Book of the One Thousand and One Nights was published in 1825â€“1838 in Arabic in 8 volumes. 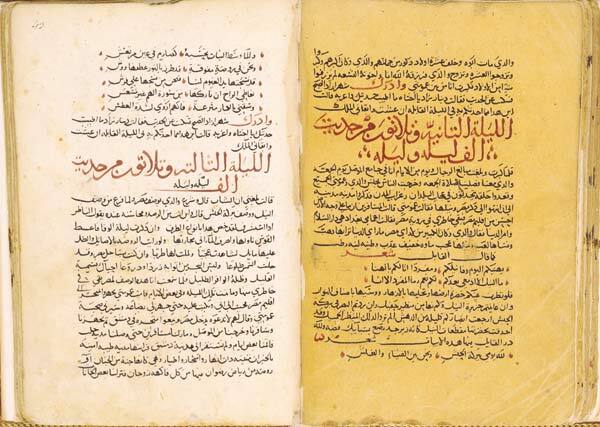 Christian Maxmilian Habicht (born in Wroclaw, Silesia, Poland, 1775, in that time seized by Prussia and called Breslau) collaborated with the Tunisian Murad Al-Najjar and created this edition containing 1001 stories. 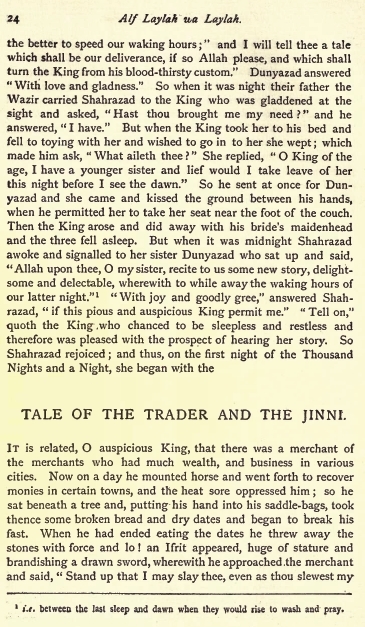 Using versions of The Nights, tales from Al-Najjar, and other stories from unknown origins Habicht published his version in Arabic and German. Four additional volumes by Habicht in 1842â€“1843. having had taken a wrong turn until the year 1945.
dressed in green holding a wreath in her raised hand. Thus spake the old woman in her ignorance of the mirror, and set out confidently to haunt the roads and avenues of her experience. She lost no time in bringing a first choice of fifteen-year-old girls to Mubarak’s palace, and led them in one by one, covered in veils and modestly casting down their eyes, to the hall where Zain and Mubarak sat with the mirror. If you had seen all those lowered eyes, candid faces, and little shy figures, you could not have doubted the purity of any; but none of these things deceived the mirror. Zain looked in the glass each time that a girl passed before him, and her reflection appeared naked to his eyes. Every part of her body was visible; each detail of her little history was thrown into relief as if it had been presented to him in a casket of diaphanous crystal. As each girl passed, poor Zain was far from finding a tiny object like a peeled almond; it astounded him to think into what gulfs his unaided judgment might have thrown the unfortunate Old Man of the Isles. As he did not wish to bring shame on any by discovering that which Allah had hidden, he never told the old woman the cause of his dissatisfaction, but contented himself with wiping the fog off the mirror. Spurred by the hope of gain and not in the least discouraged by her first failure, the old woman brought a second choice, a third and a fourth and a fifth; but the result was always the same. Multitudes and multitudes of Egyptian intimacies you saw, O Zain, of Coptish intimacies, of Nubian, Abyssinian, and Sudanese; of Moroccan intimacies, of Arab and Badawi; intimacies of girls in every way beautiful and delightful; but never one that looked at all like a peeled almond! After this disappointment the Prince and Mubarak journeyed into Syria and hired a magnificent palace in the fairest quarter of Damascus. Mubarak entered into negotiation with all the old women whose business was with marriage and the like; and these old women, on their part, entered into negotiation with every kind of little girl, tall and short, Mussulman, Jew, and Christian. Knowing nothing of the magic mirror, they confidently brought their candidates into the hall where Zain waited; but, for all their modest mien, unsullied looks, quick blushing cheeks, and fifteen years, the Syrians were no more successful than the Egyptians. The old women were obliged to retire one after the other, trailing their noses to the ground. ’Then said Prince Zain: ‘My object is marriage, O venerable sheikh. I want to find a girl of fifteen at once entirely beautiful and quite a virgin. Her beauty must be without its equal among the youth of her time and her maidenhead past cavil, both within and without. I came to Baghdad to find such a one, after having searched in Egypt and Syria without success.’ ‘Such things are rare and very difficult to find,’ said the Imam. ‘If Allah had not set me in your path, your stay would have been endless and the old women would have spent their time in vain, But I know exactly where such a pearl may be found; I will tell you, if you will allow me.’Zain and Mubarak both smiled at this. ‘O holy Imam,’ said the former, ‘are you sure of the virginity of the girl you mention? And if so, how are you sure? If you have seen that thing in the girl, she is no longer a virgin in my sense; for true virginity resides as much in keeping the seal invisible as in keeping it unbroken.’ ‘Indeed, I have not seen it myself,’ answered the Imam, ‘but I will cut off my right hand if it be not as I say. Also, my lord, how can you or any man be certain before the marriage night ?’ ‘That is easy,’ said Zain, ‘I have but to look at her for one moment, dressed and veiled.’ Out of respect for his host the Imam did not wish to laugh, but he answered: ‘Our master must be more than ordinarily skilled in the science of reading faces, if he can determine the virginity of a strange girl by regarding her through her veil.’ ‘Yet it is as I say,’ retorted Zain. ‘If it be possible, let me see the girl; I will reward your services at their just value.’ ‘I hear and I obey!’ replied the Imam and at once set out upon his quest. Abu Bakr had told the truth when he said that he knew of a girl who would meet the Prince’s requirement. She was the daughter of the chief of the Imams of Baghdad; her father had brought her up far from the eyes of men, in simple seclusion as the Book commands. She had blossomed like a flower in his home, having never looked upon ugliness. She was white and elegant, she had come without flaw from the mould of beauty; her eyes were black, her little hands and feet were fragments of the moon. She had all the grace of a circle on one side and of a straight line on the other; but that which lay between her columns, having never been seen, cannot be described. Perhaps the mirror, by Allah’s aid, may be able to tell us of it in the future. Abu Bakr made his way to the house of his chief and, after the usual greetings, made him a long speech, sprinkled with texts, on the advisability of marrying little girls as soon as they were ripe. He explained the whole situation, and thus concluded: ‘This amir is noble, rich, and generous, ready to pay any dowry. He makes only one condition: that he shall first look upon the child for a moment when she is dressed and veiled and covered with the izar.’ The girl’s father reflected for an hour, and then said: ‘I see no objection.’ He called his wife, and said to her: ‘O mother of Latifah, rise up now and take our daughter and walk with her behind Abu Bakr, our good son; for he will lead you to a palace where Fate awaits the child. (…) The wife of the sheikh of the Imams veiled herself and sought her daughter, saying: ‘O Latifah, your father wishes you to see the streets for the first time to-day.’ When she had combed and dressed the child, she went out with her and followed ten paces behind Abu Bakr to the palace, where Zain and Mubarak waited in the reception hall. O Latifah, you went in with wide dark eyes, astonished above their little veil. You had never seen a man, save your venerable father, and you did not lower your eyes, for you knew not false modesty or false shame, or any of those false things by which girls learn to take the hearts of men. You were shy, but you looked straight forth with your black eyes, so that Zain’s reason fled from him. He had never seen even the shadow of your beauty among the women of his palace or among the girls of Egypt and Syria. The reflection of you showed naked in the mirror and he could see, nestled like a little white dove between your thighs, a miracle sealed with the unbroken seal of Sulaiman (upon whom be prayer and peace!). He looked and rejoiced, O Latifah, for it had in every way the appearance of a peeled almond. Glory be to Allah, Who keeps the keys of every treasure for His Faithful! 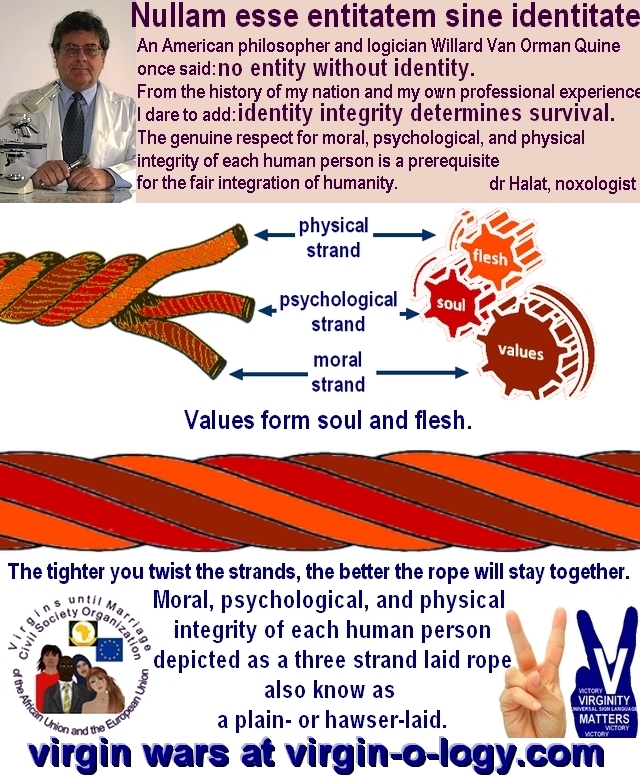 The tighter you twist the strands, the better the rope will stay together. depicted as a three strand laid rope also know as a plain- or hawser-laid. Your integrity will keep you alive for ever. Take care of your integrity or you will get lost in life. want to steal your soul and flesh. want to take away your freedom. make you dependent on them for the rest of your life. Striving for excellence and success? 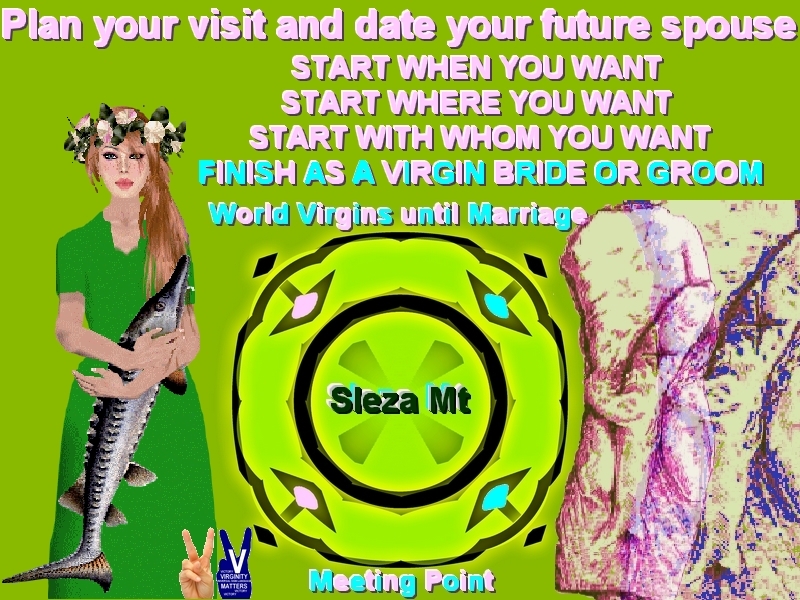 Join the real and virtual March of Virgins. World Virgins until Marriage Meeting Point. Plan your visit and date your future spouse.